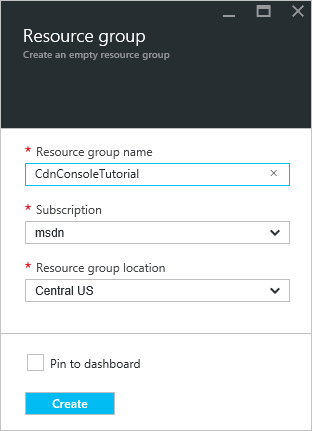 You can use the Azure CDN Library for .NET to automate creation and management of CDN profiles and endpoints. This tutorial walks through the creation of a simple .NET console application that demonstrates several of the available operations. This tutorial is not intended to describe all aspects of the Azure CDN Library for .NET in detail. 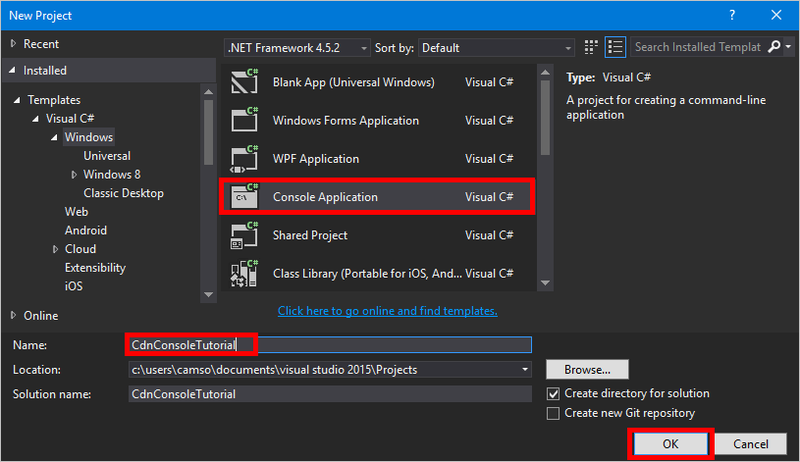 You need Visual Studio 2015 to complete this tutorial. Visual Studio Community 2015 is freely available for download. The completed project from this tutorial is available for download on MSDN. 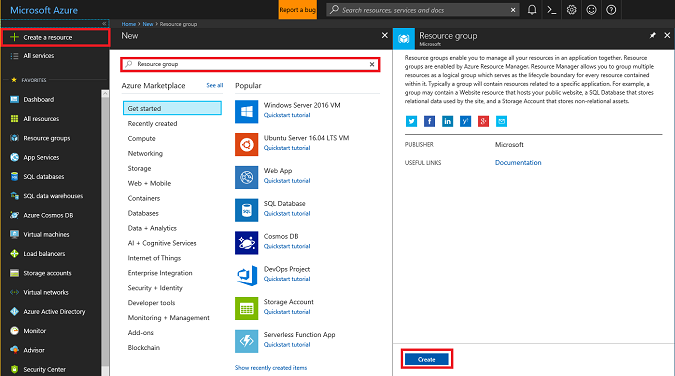 Search for Resource group and in the Resource group pane, click Create. Name your resource group CdnConsoleTutorial. Select your subscription and choose a location near you. If you wish, you can click the Pin to dashboard checkbox to pin the resource group to the dashboard in the portal. Pinning makes it easier to find later. After you've made your selections, click Create. After the resource group is created, if you didn't pin it to your dashboard, you can find it by clicking Browse, then Resource Groups. To open it, click the resource group. Make a note of your Subscription ID. We need it later. There are two approaches to app authentication with Azure Active Directory: Individual users or a service principal. A service principal is similar to a service account in Windows. Instead of granting a particular user permissions to interact with the CDN profiles, permissions are instead granted to the service principal. Service principals are typically used for automated, non-interactive processes. Even though this tutorial is writing an interactive console app, we'll focus on the service principal approach. Creating a service principal consists of several steps, including creating an Azure Active Directory application. To create it, we're going to follow this tutorial. Be sure to follow all the steps in the linked tutorial. It is important that you complete it exactly as described. Make sure to note your tenant ID, tenant domain name (commonly a .onmicrosoft.com domain unless you've specified a custom domain), client ID, and client authentication key, as we need this information later. Be careful to guard your client ID and client authentication key, as these credentials can be used by anyone to execute operations as the service principal. When you get to the step named Configure multi-tenant application, select No. 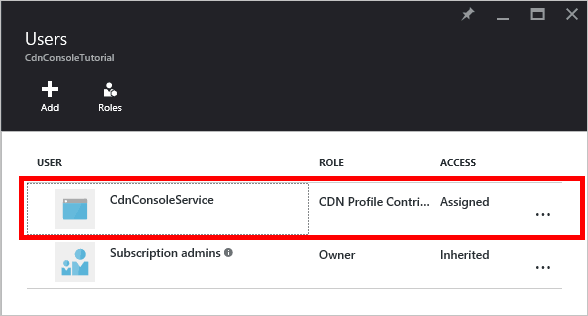 When you get to the step Assign the application to a role, use the resource group created earlier, CdnConsoleTutorial, but instead of the Reader role, assign the CDN Profile Contributor role. 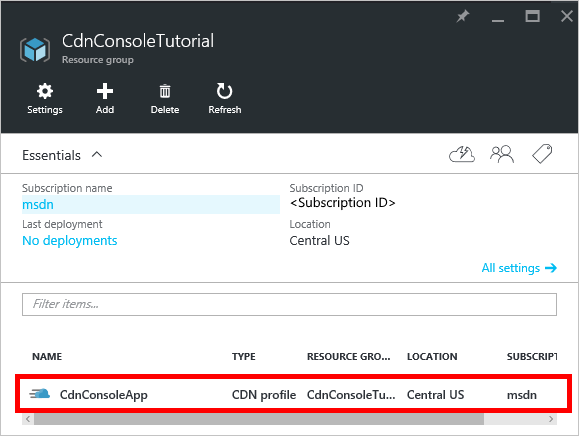 After you assign the application the CDN Profile Contributor role on your resource group, return to this tutorial. Once you've created your service principal and assigned the CDN Profile Contributor role, the Users blade for your resource group should look similar to the following image. If, instead of a service principal, you'd rather have interactive individual user authentication, the process is similar to that for a service principal. In fact, you need to follow the same procedure, but make a few minor changes. Only follow these next steps if you are choosing to use individual user authentication instead of a service principal. When creating your application, instead of Web Application, choose Native application. On the next page, you are prompted for a redirect URI. The URI won't be validated, but remember what you entered. You need it later. There is no need to create a client authentication key. Instead of assigning a service principal to the CDN Profile Contributor role, we're going to assign individual users or groups. In this example, you can see that I've assigned CDN Demo User to the CDN Profile Contributor role. 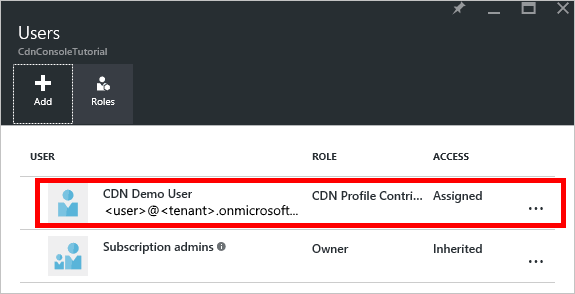 Now that we've created a resource group for our CDN profiles and given our Azure AD application permission to manage CDN profiles and endpoints within that group, we can start creating our application. From within Visual Studio 2015, click File, New, Project... to open the new project dialog. Expand Visual C#, then select Windows in the pane on the left. Click Console Application in the center pane. Name your project, then click OK.
Our project is going to use some Azure libraries contained in Nuget packages. Let's add those to the project. Click the Tools menu, Nuget Package Manager, then Package Manager Console. Let's get the basic structure of our program written. We need to define some constants our methods will use. In the Program class, but before the Main method, add the following. Be sure to replace the placeholders, including the <angle brackets>, with your own values as needed. Also at the class level, define these two variables. We'll use these later to determine if our profile and endpoint already exist. // They pressed something other than Y or N.  Let's ask them again. Now that the basic structure of our program is written, we should create the methods called by the Main method. Before we can use the Azure CDN Management Library, we need to authenticate our service principal and obtain an authentication token. This method uses ADAL to retrieve the token. If you are using individual user authentication, the GetAccessToken method will look slightly different. Only use this code sample if you are choosing to have individual user authentication instead of a service principal. 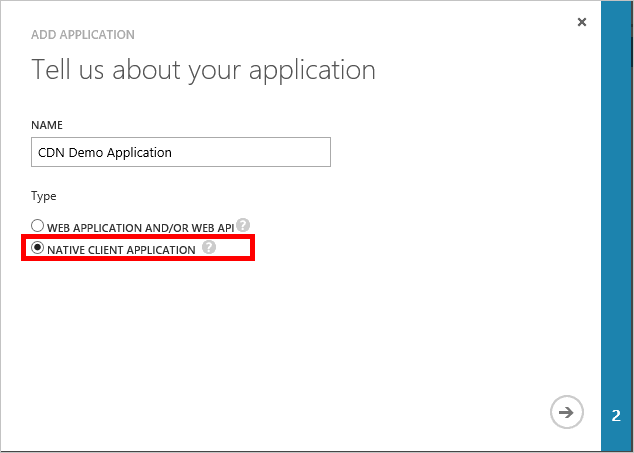 Be sure to replace <redirect URI> with the redirect URI you entered when you registered the application in Azure AD. Now we're ready to perform CDN operations. The first thing our method does is list all the profiles and endpoints in our resource group, and if it finds a match for the profile and endpoint names specified in our constants, makes a note of that for later so we don't try to create duplicates. // Hey, that's the name of the CDN profile we want to create! // The unique endpoint name already exists. Next, we'll create a profile. Once the profile is created, we'll create an endpoint. The example above assigns the endpoint an origin named Contoso with a hostname www.contoso.com. You should change this to point to your own origin's hostname. Assuming the endpoint has been created, one common task that we might want to perform in our program is purging the content in our endpoint. In the example above, the string /* denotes that I want to purge everything in the root of the endpoint path. This is equivalent to checking Purge All in the Azure portal's "purge" dialog. In the CreateCdnProfile method, I created our profile as an Azure CDN from Verizon profile using the code Sku = new Sku(SkuName.StandardVerizon), so this will be successful. However, Azure CDN from Akamai profiles do not support Purge All, so if I was using an Akamai profile for this tutorial, I would need to include specific paths to purge. The last methods will delete our endpoint and profile. 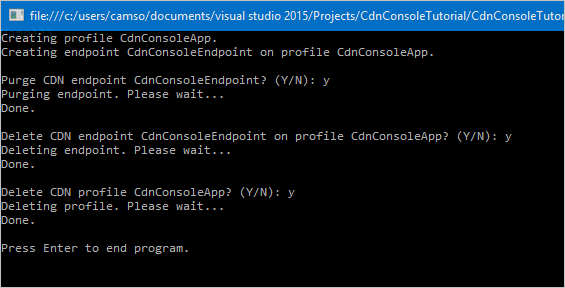 We can now compile and run the program by clicking the Start button in Visual Studio. When the program reaches the above prompt, you should be able to return to your resource group in the Azure portal and see that the profile has been created. We can then confirm the prompts to run the rest of the program. To see the completed project from this walkthrough, download the sample. To find additional documentation on the Azure CDN Management Library for .NET, view the reference on MSDN. Manage your CDN resources with PowerShell.